Houey Hong provides training for women in tailoring, in addition to it’s own tailoring service. Houey Hong’s highly skilled staff are able to create a variety of skirt, dress, shirt, jacket and trouser designs, as well as custom made garments. Accessories including hats, handbags, purses, pencil cases, placemats, coasters and pillowcase, are also sewn at the centre, and can be incorporated into tailoring courses. Tailoring courses are designed for beginners through to the more advanced. Beginner courses can take one to three months and cover an introduction to tailoring equipment, working with different materials, measuring and calculations, drawing and cutting patterns, and hand and machine sewing. The more advanced courses in tailoring usually takes an additional 2-10 weeks. Advanced training builds upon the skills learnt in the beginners course with women learning more complex designs and patterns.m. The Centre continues to use traditional methods of harvesting and processing natural ingredients to create their dyes, and over time has established an extensive database of natural colours. All ingredients are sourced within Lao, and some are grown in the Centre’s two hectare garden. Dyeing with natural materials requires a high level of skill and knowledge to ensure colours can be reproduced, and that over time the natural colours maintain their vibrancy. Women at the Centre are provided with training in the creation and use of natural dyes including: sourcing natural ingredients, preparing ingredients, preparing the raw material for dyeing, and dyeing techniques. Natural dyes are obtained from leaves, stems, twigs, flower heads, barks, roots, outer skins, hulls, husks, wood shavings, berries, seeds, lichens and insect resin. Ingredients are then processed using a large pestle and mortar mechanism to crush the material. Once the raw ingredients have been prepared they are then heated or cooled, or a combination of both, to create a diversity of natural colours. Houey Hong was established in 1998 after recognising that the traditional art of Lao silk weaving was at risk of disappearing. Over the years there has been a noticeable absence of looms beneath people’s houses, and less and less women are learning to weave. The influence of western fashions along with the competition with factory made materials, has made the preservation of this weaving tradition a challenging one. Houey Hong provides weaving courses for beginners through to the more advanced. A basic weaving course includes spinning thread onto a spool, setting up the loom, including constructing the loom, running the warp, connecting the warp to the beater, designing and setting up pattern, and the practice of traditional Laos weaving. Houey Hong pays particular attention to the quality control of woven products, including connecting the silk thread to the loom correctly, warp and edge control and colour combinations. Houey Hong places a strong emphasis on teaching the women to produce high quality woven products. 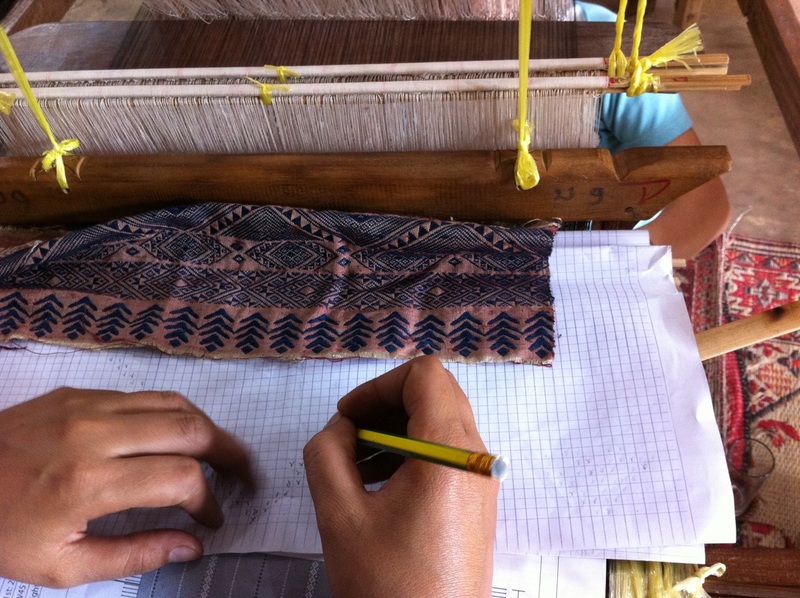 Houey Hong also provides training in the art of paper weaving, where mulberry paper, known as posa paper, is woven with silk using a Laos loom. In 2000 Houey Hong had the honour of an artist in residence, Ms Mei Kusakawa from Japan, who trained the women in the traditional art of paper making and weaving. Posa paper products are particularly popular with the Japanese, as the product is delicate yet also durable and is suitable for use as a sash with the traditional Japanese kimono dress. 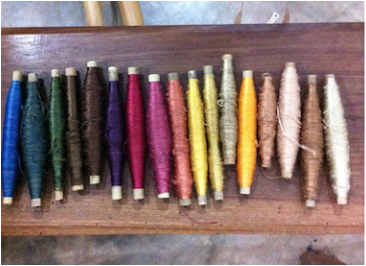 ​Houey Hong offers small scale training in small business administration as part of the natural dyeing and weaving courses. The trainers draw on experiences from the Centre and cover areas such as generating small production, selecting materials (quality, quantity, price), basic production cost evaluation and quality control. ​The Centre is currently revising training materials to include the provision of additional vocational courses such as more advanced business and administration. Through improved business skills in financial management, marketing and promotion, Houey Hong hopes to improve the ability of women to sell their products and produce at their local markets in order to generate a sustainable income. Houey Hong would also like to provide further post-training support to women who return to their villages. Houey Hong is slowly expanding its networks with a diverse range of external organisations and businesses to increase their capacity to provide post training support, such as employment, community weaving house projects, equipment provision, marketing, and micro-finance. If you are an organisation that would like to work with the Centre in developing such support networks, please contact us. Houey Hong is actively networking with other vocational training centres, NGOs and businesses to increase its employment network to assist the women in finding employment at the completion of their training. Many of the women currently employed at Houey Hong are former graduates of the Centre. If you would like to discuss the possibility of employing one of our trainees, please contact us.